Crafted in fine argentium silver for added brightness and strength, this stunning bridal ring set by Perfect Fit features an engagement ring with a sparkling round diamond cluster with double surround, sitting alongside a delicate diamond set wedding band. 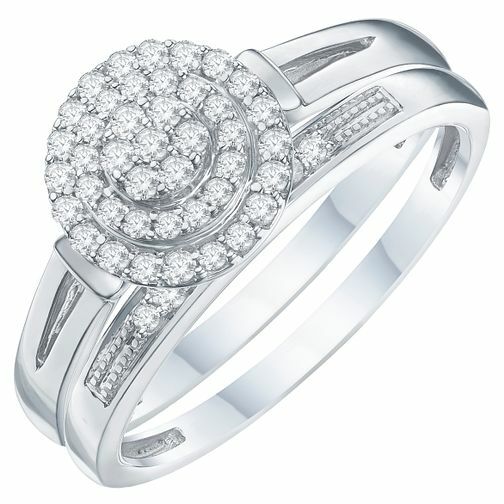 Argentium Silver & Diamond Perfect Fit Bridal Set is rated 4.0 out of 5 by 4. Rated 1 out of 5 by Anonymous from 2x diamonds fell out This was my engagement ring. I wore this ring for 10 days and a diamond fell out. I contacted customer service who then tried to charge me for a repair...after 10 days of wear??! I was told by a customer service assistant to make sure I was not shutting doors to roughly when wearing it??!! I complained about this and the repair was eventually done for free but took 2 months to be done. I then had the ring back and less than 2 months later another diamond fell out. I was SO careful with the ring. After having it back the first time I was worried about catching it or knocking it. I am not getting it exchanged for a completely different ring. This ring was perfect. I was SO in love with it and it meant so much that my partner chose it but I have had nothing but problems with it. I would like however to thank Emma from customer resolutions for sorting my issues.